Nonprofits: Learn about simple SEO optimization to attract donors to your website. Learn techniques for writing quickly and efficiently. You will also learn 8 ways to promote your new landing page. Last week we introduced Chapter 5. Landing Pages that Convert & Optimized Keywords. Today we are presenting the full version of Chapter 6 on Simple SEO Optimization so you can get started driving the right people to your website and perfecting their experience. Chapter 6. SEO Optimization: Keywords, Writing and Content Marketing. Tab 1. The Importance of SEO Optimization, Writing & Content Marketing: Overview of Chapter 6. Tab 2. Guide 16. Demystifying SEO Optimization. Tab 3. Guide 17. Writing Techniques. Tab 4. Guide 18. Content Marketing. Chapter 6 is set-up for you in the 4 tabs just below. SEO Optimization: Keywords, Writing and Content Marketing: Time Requirement. Simple SEO Optimization: 1 Hour. Total Time for Chapter 6. Three Hours. In this chapter you will learn how to use SEO Optimization with your keywords and landing pages to attract donors to your website. You will also learn 3 techniques for writing quickly and efficiently—and learn 8 ways to promote your new landing page. Chapter 6 is set-up for you in the 4 tabs below. CHAPTER 6 Overview. SEO Optimization: Keywords, Writing and Content Marketing. The Importance of SEO Optimization and Content Marketing: Overview of Chapter 6. This week in Chapter 6 we’re going to learn ways to optimize your landing page keywords using a WordPress plugin for SEO Tools: Yoast. You’re going to learn three techniques for writing more quickly and efficiently. And, we’re going 8 ways to promote your landing pages. Learn More details on how to design a website. Guide 16. Using Yoast’s SEO Tools to optimize your keywords and landing pages. In the first section of Chapter 6, we will demystify SEO. You will use keywords in your headings, page title, page description and content. You will also learn the importance of posting information rich, long content. This week we’re also going to learn three techniques for writing better—and writing more quickly and efficiently. Guide 18. Promote your new landing page. Promoting new landing pages or blog posts accomplishes several things. 1. Meeting new donors and subscribers. One is that it gets information out there on the Internet that might interest new potential subscribers and donors. This can increase donations and help build your email list. 2. Making your pages more visible to Google. Interested people who read your promotional pieces might also link to them from their website creating backlinks and encouraging Google to increase your page rank. So now, click on the second tab to learn about SEO Optimization for your keywords and for your landing page using SEO tools . Click on the third tab to learn all about writing techniques. And click on the fourth tab to see 8 ways to promote your new landing pages. Next week, in the next chapter (Chapter 7), we’re going to learn: Marketing and Communications. Determining what to market to whom. Back to links for SEO Optimization: Keywords, Writing and Content Marketing. Guide 16 Yoast SEO: Demystifying SEO Optimization. Use SEO Optimization to insert keywords in your headings, page title, page description and content. Post information rich, long content. Search Engine Optimization (SEO). Yeesh. Sounds daunting doesn’t it? When a potential donor is looking for a local food bank they might type in something like "food banks in Claremont." Google has visited your website over time and has stored information about your individual pages. 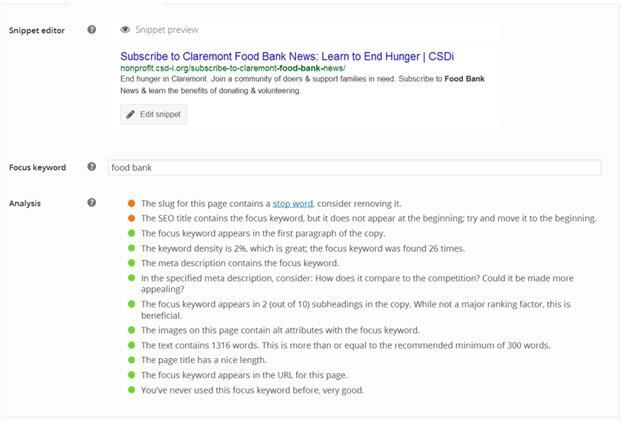 If you have a page with words that say "food banks in Claremont" Google will make the connection between that potential donor’s search and your food bank page. We learned in Chapter 5 that this is all driven by the words that they use to search for food banks and the matching words on your web page. If you’ve done a good job of researching the search terms that potential donors have been using to find your site, then you should have a good trove of keywords at your disposal for your different landing pages. SEO Optimization encourages you to use these keywords on webpages in a manner that will be most relevant to Google and that will encourage them to post a link to your page on the potential donor’s search results. This is called ranking: "you ranked the first page." As this is a beginner’s guide I’m going to keep this as simple as possible. Please bear in mind that there are several levels of sophistication beyond what we will discuss here that I encourage you to explore. I will post a series of links at the end of this chapter to help you with those explorations. My guess is that as a nonprofit you’re hoping to increase donations, increase your volunteer base, and grow your newsletter mailing list. What SEO Optimization allows you to do is to target specific pages to specific searches that potential donors are conducting. So you want a single page to be focused on a single concept and a single focused keyword—and to have information to share which is specifically relevant to that concept and keyword. If you feel this is too limiting, I’ll suggest three things. One, if you’re struggling with the fact that you have three concepts that you would like to present on a single page, consider creating three pages instead. Two, check out some of the resources that I’m providing at the end of the chapter and look at how much information many of them provide on a single page. You’re not limited by how much information you can provide on a page that’s geared to a single focus keyword, it’s just that all of that information needs to relate to the focus keyword. Many of the pages that you can look at in the resources below have an excess of 2000 words—they just relate to that one topic. Three, the Premium, paid version of Yoast shows you how to have up to five focus keywords per page. So something that I would be tempted to do would be to expand upon the chart that you began in chapter 5.1 where you listed your programs and their a potential keywords. Continue to maintain and expand this Excel spreadsheet as you come up with new ideas for new information about a specific topic. So you can see that you can take what may have been a general landing page about subscribing to a food bank newsletter and create four specialized pages. Each has their own focus keyword, and their own relevant supporting information. This isn’t that difficult to do, you can simply copy the ‘general newsletter’ page onto a new ‘donor newsletter’ page, research and effective keyword for that page, and then edit the content to support that keyword. Searches are almost always intended to discover information on a single subject. So organize your landing pages and their focus keywords into ‘buckets’ of intent. 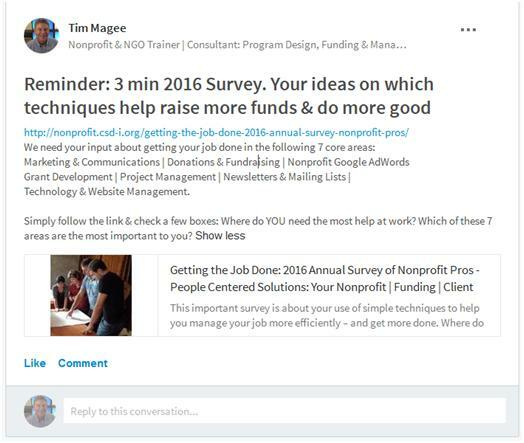 So, now, rather than simply having one page attracting general supporters for your nonprofit, you can have four pages working away for you—even while you sleep! You could even let these four new pages do double duty for you by using them as a individual newsletters. How do you begin optimizing your webpages with SEO Tools? So now the hard part is over: you have chosen a specific topic and researched and chosen a focus keyword—and have begun writing content for a page. For the rest the chapter we’re going to begin going through some simple SEO Optimization techniques that you can do in a few minutes. You’ll find that these techniques follow the Chapter 5 landing page checklist very closely. If you have installed the Yoast SEO Optimization plug-in for your WordPress site—then this SEO work will be a snap. First: Start a master Excel spreadsheet which lists your existing webpages with their page titles and their focus keywords. 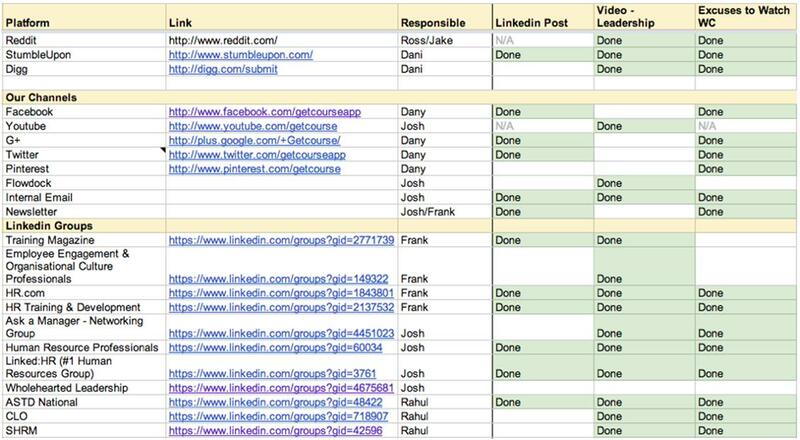 Each time you develop a new webpage add it to this spreadsheet along with its focus keyword. This will help you keep from duplicating keywords. Use the WordPress’s SEO Optimization plugin ‘Yoast’ to quickly and efficiently manage SEO. Now, open up your new landing page in editing mode in WordPress. Scroll down to the bottom to Yoast’s SEO Optimization Tools. It will prompt you to make some optimizations. You probably did most of the background work for this in Chapter 5, but Yoast’s SEO Optimization Tools will prompt you to make some refinements and to optimize your SEO. In chapter 5 when you did your keyword research for the new landing page, you were able to use that information to develop the page title. You should also have come up with a focus keyword for the landing page which will be the main keyword on the landing page that Google will lock in on. The focus keyword should be a keyword that you saw people using over and over again that you discovered while researching your page title. This will indicate that other organizations who have done keyword research and found the importance of using that keyword: you can use it to! In the advanced keyword research techniques that you used in chapter 5, I showed you how to find search terms that real people are using; this is called the voice of the customer. This should also be very helpful for you in choosing your focus keyword. Finally, you want your focus keyword to clarify an Internet searcher’s focus so that they will have a valid reason for visiting your website. For example, if they use the focus keyword ‘food,’ it would be highly competitive with other people using the word food. This could include grocery stores and restaurants—so you might have trouble showing up on the first page when so many other people are using that keyword. Also, you might get a much higher number of unqualified visitors to your website. By simply making your focus keyword two or three words long, you can reduce the competition and give people a better idea that your site is exactly what they’re looking for. So by simply changing my focus keyword from ‘food’ to ‘food bank’ or ‘food pantry’ I will get out of competition with restaurants that are also using the word ‘food’ and let Internet searchers more specifically know what it is that I have to offer on my landing page and in my organization. You did quite a bit of work to find the best title for your landing page. Yoast’s SEO Tools are going to make sure that it is the right length and that it contains your focus keyword. It will also suggest that your focus keyword is near the front of the title. Subscribe to Claremont Food Bank News: Learn to End Hunger | CSDi (65 characters). This includes your website title which in my case is CSDi and is automatically inserted. Subscribe to Claremont Food Bank News: Learn to End Hunger (58) + | CSDi (7) = (65 total characters including spaces). The meta description is what shows up in Google search results. Therefore, a catchy title and your compelling description will make or break a searcher’s decision to click through to your website. The meta description should quickly and compellingly encapsulate what you’re trying to accomplish on the landing page—and include a call for action. I find that by inserting my meta-description into the landing page itself I can see it clearly, and in context. Sometimes this prompts be to make minor changes which actually improve the meta-description. The reason that I have been encouraging you not to publish your landing page all this time that you’ve been working on it, is because we want to make sure that your URL is perfect. Google remembers all of your URLs. If you publish your page too early and later decide you don’t like your URL—and change it—Google will wonder what happened to the first URL that you had published and may even send you an error message. So, by holding off publishing your page until you’ve done your keyword research, discovered what your focus keyword is and written your meta-description—you can use them to help get your URL just the way you like it before you hit the publish button. Your URL should be relatively short, should contain your focus keyword, and should be a very short description of what your landing page will offer to a visitor. This will give credibility to your search results. For example, if you’re offering a free guide to food banks and your URL says " https://nonprofit.csd-i.org/pay-here-for-the guide/" it’s going to make people think twice. Perhaps this would be better: " https://nonprofit.csd-i.org/subscribe-to-claremont-food-bank-news/" . So you want your URL to be consistent with what it is they’re hoping to find if they click on your landing page link. Yoast’s SEO Optimization Tools will prompt you with ways to improve your URL prior to publishing. 5. H1 headline. H2 headline. At the very top of your landing page you will typically see a main headline and a subheading. If you are building your individual pages in visual editing mode, you can write your headline at the top, and format it as a heading one or a heading two heading. One of your two headings needs to contain the focus keyword. 6. Focus keyword in the page’s content. Yoast’s SEO Optimization Tools will prompt you to make sure that you include your focus keyword in your title, your page header (h1, h2) your meta-description, the first paragraph of your landing page and that it is included enough times in the content of your landing page that it will be between 2% and 5% of the words. 7. Alt attributes for images. This is a little more of an advanced technique. Since Google can’t "read" photographs it likes to see a text description of the photograph. In the visual editing mode you can select a photograph that you’ve inserted and click edit. You’ll be shown a box where you can enter ‘Alternative text.’ You can type in a text description of the photo: make sure you include the focus keyword. In the food bank subscription landing page example that we’ve been using, I put in alternative text that says "Isaac Vega and Client in Claremont’s Hope Partners Food Bank." The alternative text is invisible on your webpage. 8. Number of words on a page. It is generally acknowledged that webpages with more than 2000 words perform better than shorter pages. Pages of this length are rich with information and useful words. Google likes this and will increase your ranking accordingly. Also, serious Internet searchers finding authoritative pages such as this may learn a lot about what they’re hoping to find and may insert a link to your page from their website (like I’ve done at the end of this assignment with other expert sites). These are called backlinks and Google likes backlinks too. Yoast’s SEO Tools provide a prompt for you that lets you know how many words are in your post and if you’ve exceeded their minimum of 300 words. SEO vs. PPC – Which Provides You the Better Value? This is a an interesting study about points out that organic search results are more effective than PPC search results. Interesting article looking how to determine if it’s effective targeting more than one focus keyword on a webpage. This looks at including focus keywords in two links on your page (anchors). Don’t use "click here", use descriptive text instead. What Is The IDEAL Keyword Density Percentage To Improve Rankings? Very good and healthy basic overview. Also has a downloadable document on growing your mailing list. Why My Optimized Landing Pages Trump Your SEO Or PPC Landing Pages Every Time! Guide 17 Writing Techniques. This week we’re going to learn three techniques for writing more quickly and efficiently that will tie in perfectly with Yoast’s SEO Optimization Tools. Download the PDF of the full four-page Writing Guide—it’s full of great tips and techniques. I’m certain that all of us get bogged down with writing from time to time. We have the normal responsibilities of our job—and then need to write content for our websites and send out regular newsletters. It can be difficult to maintain sometimes. There are a number of things that you can do to make it easier—with the result of higher quality, more useful work with a smaller time investment. Guide 18 Promotion: Build visibility and attract visitors: Promote your blog or landing page to colleagues: earn their links (Google likes links!). Okay. You have written an excellent landing page or blog post. You’ve done keyword research and used Yoast’s SEO Optimization Tools to optimize your on-page SE0. With this approach, people searching the Internet with keywords you used in your landing page may find search results about your landing page. This is called organic search. In Chapter 14 will be looking at the series of tools which will let you see how your pages are ranking and which keywords they’re ranking for. You can use this information to optimize keywords on your page to help you get better ranking scores. But that’s pretty advanced. And as this is a book for beginners—so let’s look at some other things that you can do right now. I’m going to also posts a few links at the end of this section where you can see what experts do for promoting their pages and posts. Preparation for promoting your posts. The first thing that I would recommend doing in preparation for promoting your posts/pages is to create a compact version of them. If you’ve developed a template for your landing page you can use that to speed up the process of building new landing pages. You can also develop a template for (for example) a newsletter which uses components of your landing page. So when you publish a new landing page you can send out the compact newsletter version about the subject—and link to the full version on your site. In Chapter 10 we will be going over newsletters in detail and so you will have the chance of creating a template there. With some simple cutting and pasting from your landing page into your newsletter template, you can create a new newsletter in a few minutes. So this new newsletter template can be used for lots of things that beginners can do and that’s what we’re going to go over right now. This is a combination of 1) different kinds of platforms where you can post based upon 2) who it is you’re hoping to promote to. Also, since we’re going to be discussing your newsletter in chapter 10, and since your newsletter list is composed of people that have already subscribed I’m going to focus this discussion on getting your information in front of people who might not know much about you—yet. So the first question is: who do you want to promote to? If you want to promote to potential new supporters (donors, volunteers, and subscribers) then you need to be developing a list beginning today of places that your potential supporters visit where you could post information. Here’s some simple ideas to get you started. There might be Facebook pages where donors like to go to hear about projects that they’ve donated to. You can ‘like’ that page and then post to it with a link back to your landing page. Twitter also works well for this. It is obvious that you will be posting information to your own Facebook and Twitter accounts, so what I’m really talking about here are other people’s Facebook pages and twitter feeds. The same works with Google groups and Yahoo! Groups and LinkedIn groups. Some of these groups are quite large (in excess of 50,000 people). Typically, these groups frown on self-promotion so information that you provide about your new landing page will need to have an informational or educational field to it. How do you find these resources? The first thing to do is to keep your eyes open. For example, when you are searching Google for potential keywords for your landing page, you may have seen blogs and pages and groups highlighted in the search results. I have an icon on my desktop for an Excel spreadsheet that I can quickly open and paste in new resources. Also, when you find an interesting looking site where potential supporters might visit, you might see links to other similar sites. These might be people like you who have posting information about a new blog they’ve released. Make a note of the similar sites. Another trick along this line, is that if you see someone posting to a group, you can Google their name and see what other groups they post to. In other words, there will invariably be people out there with similarities to you who’ve already done a fair amount of research that you can take advantage of. "top" + "non profit blogs"
This is something that you could give as a project to volunteer. You could set a goal of identifying the 10 top social networks, groups or communities that are visited by potential donors—and that allow people such as yourself to post information. There are respected people in the blogging world with very large followings. Many of these people allow guests to submit a blog. If you can identify someone in your nonprofit community with a large following and be allowed to post a high quality information piece to their blog it will do two things. It will introduce your information to 50,000 people that you didn’t know before, and it will help your Google page ranking because Google will see that an authoritative site has linked to your blog. There are a couple of reasons why people would let you post a guest blog. One, is that they do it themselves to promote their own work so they understand the value of letting someone else do it. Two, it’s a lot of work researching and writing a high quality blog posting, and by allowing guests to post to their blog it reduces their workload. When you are researching keywords on Google for your landing page, I’m certain that you probably saw 10 popular blogs that were written about the keywords you were researching. You might not have realized they were blog posts. [If you look at the resources at the end of the Yoast SEO section of this chapter, you will find that most of them are blog posts.] These may be people that you could approach. You can tell if they allow guest bloggers by looking at their list of blogs and seeing if people other than themselves have been authors. There are a number of organizations out there which connect volunteers to nonprofits. You can Google something like "volunteer for a nonprofit" and see a list of 10 of these kinds of organizations. Volunteer Match is one of the largest and oldest. All that you need to do is to register your nonprofit with Volunteer Match and then you can begin posting volunteer positions that are available. This is a great way to get your message out. They offer a number of different filters. So for example, you can filter by your hometown and you can filter by age. If you promote a volunteer position to people in your locale with interests similar to your donors you could kill two birds with one stone. Many potential donors may be looking for a volunteer position as well. Also, if your post is well written, a casual visitor to Volunteer Match may click through to your website and subscribe to your newsletter. In summary, these were some ideas of alternate places to begin posting information about your organization different to your normal Facebook page and email newsletter. In the next chapter (Chapter 6) we’re going to optimize your landing pages with simple SEO so that potential donors find you. Want to enjoy this chapter’s learning process with a teacher? See the online, teacher-led course behind this chapter.